$579.00 This item is selling for $579.00 on eBay. Rustic Log Headboard with Engraved Bear Now you can have the LOOK of a log bed for a little less money! Rustic log headboard features mortise and tenon joinery. 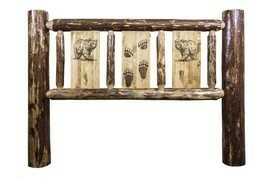 Very robust and sturdy headboard for a nice rustic look, without the expense of buying the complete bed. All the headboards come un-drilled so that you can fit them to any traditional bed frame or mount to the wall. Just simply drill the holes where you need them in the posts to fit your frame. Bed posts are approximately 5 1/2" in diameter Fully assembled Free shipping to the lower 48 states Stained and varnished Logs are all hand peeled and then stained and varnished for the nice darker look, with a unique engraving on the wooden panels. Headboard is solid pine. The engraved images pictured here may vary slightly due to the density and coloration of the wood being engraved, but will be very similar. Overall Headboard Dimensions are: TWIN: 46"w x 6"d x 47"h FULL: 60"w x 6"d x 47"h QUEEN: 66"w x 6"d x 47"h KING: 80"w x 6"d x 47"h CA-KING: 76"w x 6"d x 47"h *** *** *** *** *** SHIPPING POLICY These rustic log headboards will usually ship within 10-15 business days via a freight trucking agency. The freight company will contact you to schedule delivery once they get to your area. Usually with a 24 hour notice. We will send tracking info once it leaves the shop so you can track it that way as well. All our shipping prices or free shipping items are for the lower 48 states..Local pickup is available as well. ( Please contact us for Pick-Up prices) PAYMENT POLICY We accept Paypal as payment. Debit and credit cards can be used at the/paypal checkout. RETURN POLICY Our furniture is insured against freight damage. Should freight damage be determined, we will either arrange to have the merchandise repaired to factory new conditions or replaced at no cost to you and as expeditiously as possible. All our products come with a 20-year limited warranty at no additional expense.Your satisfaction is guaranteed!